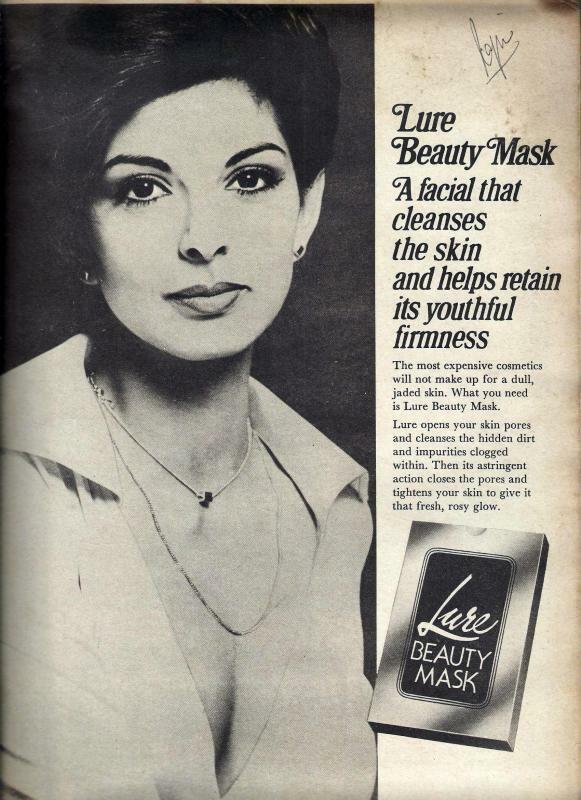 Ad for Lure Beauty Mask. Early 1970s. Model: no clue but uber. Update: Model is in fact famous Persis Khambatta [Thanks, Geetali! You are awesome!]. I had a hunch but didn't pursue it because of previous 'no she is not' experience. It's incredible how her looks changed through the 60s - Miss India and 'Bombai Raat Ke Bahon Mein', 70s - the ads and then the 80s - the Star Trek head shave. Update: Thanks to an anonymous tip-off (check comments) we have another (more probable) name - Yasmin Daji., who was crowned Miss India in 1966 by Persis Khambatta. Apparently this same image was used by Persis Khambatta in her coffee table book 'Pride of India' (1997). Update: I checked that book and it is indeed Yasmin Daji. And this image is used in the book. This post brought back a flood of memories; essentially because ''Lure'' advertised a lot in Stardust and my mother was a purveyor of cinema gossip and Shobha De's (then Shobha Kilachand) writing. Lure usually took out a full-page ad and there was Persis looking so cool and classical in her gorgeous Persian-like features :) Must add here that I don't remember the maternal unit ever buying the ''beauty mask'', even though we routinely oohed and aahed over Persis! Hey I remember your note about 'Angle Face'. And I did finally see an 'Angle Face' ad in an old film magazine up for sale over at ebay. And surprise surprise it featured Shobha De. I was going to buy it but then the issue was sold within days. The picture is of Yasmin Daji (Nanavati) who was Miss India 1966 and was 3rd runner up at Miss Universe 1966. The very same picture has been used in the book Pride of India by Persis Khambatta. that is really interesting. Thanks! Will update the post with this info.